Financial technology or FinTech can be broadly characterized as one of the ways to bring disruptive and transformative innovations in the field of financial services. These innovations are made through the emerging new technologies that address the customer requirements through automation. The year 2017 was a great year for the financial service sector. Artificial intelligence, blockchain, and other technological advancements were witnessed during the last year. Implementation of regulatory guidelines in the financial sector was also witnessed during the year. The year 2017 made it clear that the people are more willing to manage their money online ditching long queues and manual visits to the bank. In the recent years, paper money has lost its value and people are getting comfortable with the plastic or digital money. Digital currencies like Bitcoin, Ripple, Litecoin etc. have gained popularity in a very short time and are widely accepted by the people all over the globe. The ways of lending have also transformed and all the lending processes have become digital. This trend of digital lending is expected to grow in the year 2018 and digital currencies are expected to become more popular. Artificial intelligence will be the top trend that will be in focus throughout the months left in the completion of the year 2018. Leveraging advanced cognitive AI solutions to decrease the costs and overheads of the financial services will gain popularity. Artificial intelligence will be actively used by all FinTech companies and startups to stay ahead of the competitors. FinTech companies will make the most out of AI and will be used for detecting frauds, doing analytics and for providing various anti-money laundering solutions to the companies. Following the response of customers towards the digital management of the money, many FinTech companies are emerging time and now. Big-shot companies too are investing their money into new and emerging FinTech companies, rejecting the traditional way of funding and giving preference to Initial Coin Offerings (ICO’s) as their funding channel. The year 2018 has witnessed many new FinTech companies not only in India but all over the globe and the success of new companies has definitely attracted more investments in this sector. Blockchain technology is expected to have an enormous impact on the services provided by the FinTech companies. Whether it is the procedure of conducting transactions or optimizing assets, blockchain technology is going to make all these procedures as well as a variety of other business processes quick and easy. Global FinTech survey results show that by the year 2022, 77% of the global companies in the financial sector plan to take blockchain into live production. In the near future, blockchain is likely to increase speed, efficiency, security and lower the costs of a majority of operations of the FinTech companies. With mobile phones being the center of everybody’s life at the present, FinTech sector too is taking advantage of the same. Because of an increase in the use of mobile devices by people across the globe, financial services are also going mobile. Mobile banking lets customers manage their finances with just a few clicks rather than going to the banks personally. People have shown a great response to mobile services and are more comfortable managing their account transaction with just a few clicks. Mobile FinTech trading apps like Matador etc. have enabled the customers to make investments in the stock market without having to pay the broker fees. All the activities are done just with the smartphones. It is believed that the FinTech companies will start developing their own mobile strategy and take the game to a whole new level. Cybersecurity has definitely become a focal point in the meeting for the businesses and governments all over the world. Recent breaches of data and the impact of WannaCry Ransomware has made cybersecurity a significant concern for the companies. These breaches had a deep impact on approximately 143 million people and with the technological advancements made every day, data breaches of such kinds are expected to increase and fruitful in their efforts. FinTech companies are paying undivided attention in improving the cybersecurity as cybersecurity investments reached approximately $5 billion in the year 2017. The investors and enterprises are expected to invest in next-generation technology to curb the cyber thefts. According to statistics, the financial industry has received $17.4 billion investment in the year 2017 and is thriving globally. 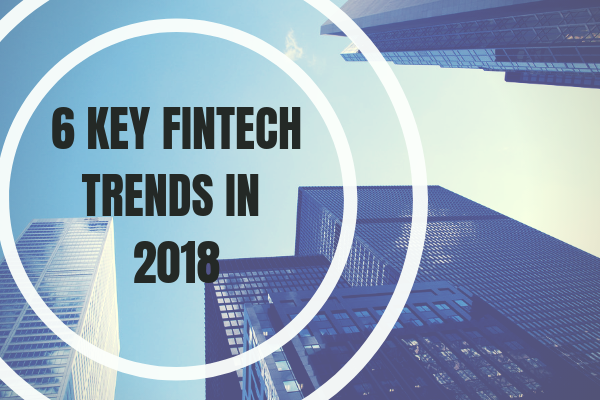 The FinTech trends are all technology backed and all the FinTech companies must overcome the final barriers and roadblocks to spread the adoption and bring a reform in the financial services.